Three Inland Northwest volleyball teams are either in first place and/or unbeaten in their respective conferences. That’s old hat for three-time defending Northwest Conference champion Whitworth and North Idaho College is used to being in the title-chase mix. Now meet Gonzaga, 4-0 in the WCC for the first time in 27 years. Surprised? You have company. Gonzaga lost six seniors from last year’s team, which tied for third in conference in Nelson’s first season. The coaches’ preseason poll pegged GU for ninth in the 10-team WCC. At one point, the Bulldogs were 4-7, but they’ve rattled off five straight wins, including the last four over the conference’s Bay Area schools. Gonzaga has some experience with Faith Smith, Katelyn Oppio, 2016 redshirt Kaylie Loewen, Duke graduate transfer Alyse Whitaker, Tiyana Hallums and sophomore Jenna Kuehn, who recorded the school’s first triple-double in the rally scoring era (since 2001) in a recent victory over Saint Mary’s. The Zags are also relying on freshmen Sarah Penner and Chapin Gray, who rank 1-2 in kills, and Abby Knapp. 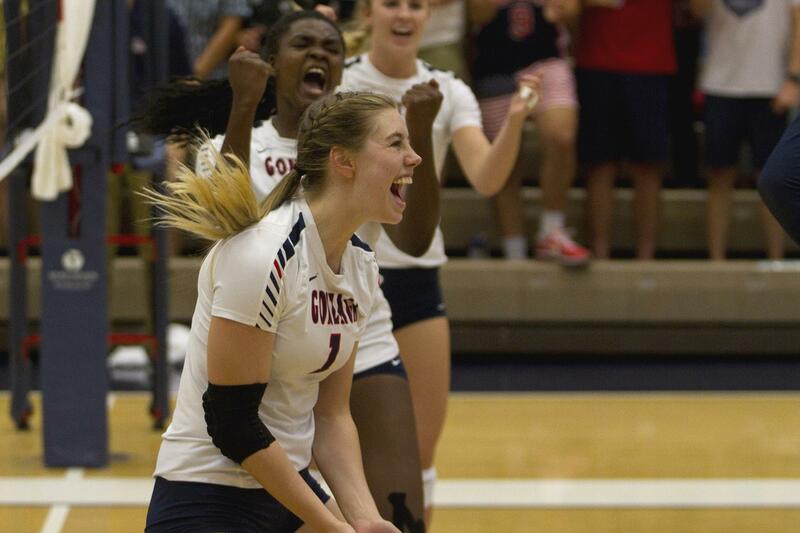 The Zags have won four consecutive five-set matches. Whitworth dropped its Northwest Conference opener to Pacific Lutheran, but the Pirates have responded with five straight wins, all 3-0 sweeps. They are tied for first with PLU and Pacific, which visits Whitworth at 6 p.m. Friday. Team captains Taylor Wicht, Cassandra Mendoza and Emiko Kahler have set the tone on and off the court. Mendoza’s 159 kills are tied for second in the NWC. Wicht’s 242 digs rank fourth and Kahler’s 122 kills are eighth. North Idaho College is 5-0 in the NWAC East Division, trailing only Columbia Basin (7-0). The best news for the Cardinals, who have battled through several health issues, is they’ve left room for improvement. Their best might be required this week. NIC entertains Spokane (4-1) at 6 p.m. Wednesday in the last of a six-game homestand. The Cards visit Columbia Basin on Friday. Washington State (12-4, 1-3 Pac-12) returns home to face No. 25 Colorado on Friday and No. 17 Utah on Sunday. The Cougars lost twice last week and didn’t receive any votes in the AVCA poll for the first time this season. … Idaho (8-7, 3-1 Big Sky), which holds down second in the North Division, and Eastern Washington (5-8, 2-2) visit Southern Utah and Northern Arizona this week. Published: Oct. 3, 2017, 6:42 p.m. Updated: Oct. 3, 2017, 6:42 p.m.